Seaside Walk Week is coming to North Cornwall! 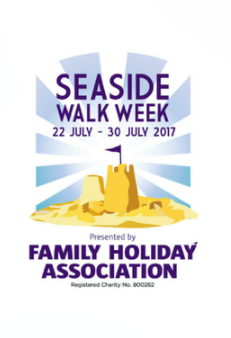 Seaside Walk Week is the Family Holiday Association’s annual event encouraging the nation to explore the Great British coastline with family and friends from Saturday 22nd July to Sunday 30th July. The official finale walk will start at Mother Ivey’s Bay on Sunday 30th July and will conclude with a barbeque on the beach and sandcastle competition hosted by the award-winning Mother Ivey’s Bay Holiday Park. The walk is ideal for families of all ages, with a shorter walk of approximately 40 minutes and a longer walk lasting approximately 1 hour 30 minutes. The walk will be guided by rangers from the National Trust who will lead walkers around the stretch of coast, Trevose Head, and explain about the history, wildlife and habitats of this beautiful area. Refreshments will be available to purchase at the start of the walk from Wadebridge Foodbank. Tickets cost £10.00 for adults (aged over 16) and £2.50 for children (aged 5-15) and all income from walker registration will be split between the Family Holiday Association and the National Trust.